Have you made special efforts to try to keep healthy into old age and has it worked? Or have you just taken a chance and its worked out well for you anyway? 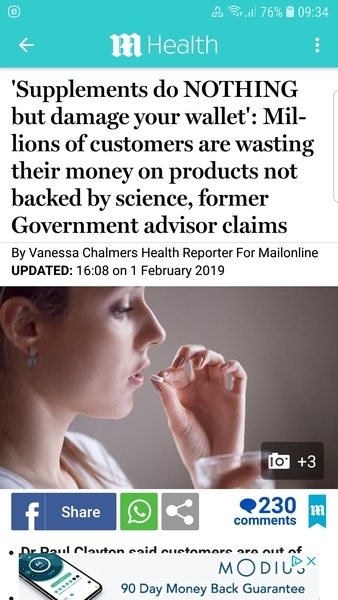 In my forties and before actually I started getting really bad colds so decided to take vitamins in the hope it made a difference. I feel it did and DH and I take a selection each day. We still get ill occasionally, but feel we are doing the best we can to keep healthy. We eat a variety fruit and veg every day. I am diabetic type 2, 20 years this year, which I put down to my very sweet tooth. Once diagnosed I changed my eating plan. DH up till last year had no issues at all but now takes meds for high blood pressure. We are both very fortunate that at this time we can walk freely. We have both taken cod liver oil daily for 30 odd years or so and believe this helps. I have always lived a fairly healthy life. Was never overweight until a bit of weight gain after the menopause. I have always excersied, long walks, cycling, exercise bike. It hasn't made the slightest bit of difference. Now, at 77, I feel completely knackered. My spine feels as if it won't support my body which makes me puff and blow. I get bad backache. I feel as though I am totally running out of time. What will be, will be. Doesn't make a bit of difference how well you prepare for older age. It hits you like a brick, and it's a bugger. I'm sure you will get some more positive responses soon overthehill. Ignore me. I started going to the gym when I reached 41, it has done as much for my mental health as my physical health. I feel much like Gonegirl does. I have always tried to keep healthy, eating sensibly and exercising several times a week and was proud not to need any medication. Unfortunately along came my seventies and I suffered from Polymyalgia Rheumatica followed by Rheumatoid Arthritis, which I am stuck with for the rest of my life. I still try to keep moving but it is painful sometimes and I rely on a large bag full of tablets each month including steroids which have caused me to pile on extra weight which I am trying to lose. Getting old is no fun! Mine's a positive post. I decided about three years ago to make some drastic changes to our lifestyle and if they didn't work, nothing lost. Gluten free diet sorted IBS within a week and gradually my arthritic knees improved. Two stone weight loss (with more to come off) also helped my knees so much I don't have any pain at all now. Weight loss also helped my self esteem (new clothes) and spending hours outdoors gardening keeps my mood in a good place. We have a mainly vegetarian diet but eat chicken and fish. Supplements in the winter months include echinacea to help boost the immune system and ward off the lurgy, multi-vits and cod liver oil capsules. So far, so good. Not smug......my fingers are always crossed because DH doesn't half like to scare the living daylights out of me with his health scares. I don't take anything for granted though. I too try to eat healthly and did regular exercises. i would run three times a week doing 3miles each time.Once i could no longer do that i did aerobics 3 times weekly along with walking everywhere i could, playing outdoor bowl 2 to 3 times per week, and looking after a large garden.I have problems with the discs in my spine, now i think i have a hip issue too, and my knuckles in my fingers are mishapen with it and also my poor toes. I am just 66 and dread to think how it will be in another few years. I do wonder if it was worth it or did i cause the arthritis to be come worse by doing all those exercise. Well done Merlotgran - I too decided 3 years ago that if I wanted to remain fit and well I would have to be proactive rather than the couch potato I have an inclination to be! I also do a minute plank most mornings as I had a horrendous bad back a year ago and that seems to keep it in line - anything is better than taking strong painkillers and hobbling with a stick. I’m only 63 and I felt so old....! I also slather anti-bacterial gel on my hands whenever I go out so that there’s less chance of catching someone else’s cold (use sleeve or scarf to open doors in shops etc) and try to eat a varied diet (all the colours) mostly cooked from scratch. Unlike my husband I’ve been blessed with good health but I’m scared of being ill/infirm as I head into the last third of my innings so any small gradual improvements I can make are going to pay dividends- I hope! I walk every day with my dog and that's about it. I dislike gyms and organised activity. I do think it is important to keep active and interested. A positive mind is the most important asset. My mother was physically fit well into her 80s. My grandmother self-medicated with Guinness and that kept her fit and active until she was 84, without any other medication. I think a lot of it is in our genes. I do think that running is bad for the joints and spine, from what I can observe. But keep moving is the key! I forgot to mention my digestive problems. Acid reflux, probably caused by my collapsed shape. I really thought I would have an easy old age. But at least mine are little nigglings things. Nothing major (touch wood) like some have. I guess I'm really very lucky. I think genetic inheritance and up bringing comes into it as well. I come from a healthy and long lived family who have had very positive attitudes to life and looking after themselves. I have always been proactive about my life and looking after myself and I think a lot of that is neture and nurture.. DH comes from genetically less robust stock, but also doesn't make much effort to look after himself either, mainly because he can be very 'glass half empty' in his approach to life. Again a combination of nature and nurture. DH and I take Vitamin C daily. Also Omega 3 Fish Oils which I believe keeps my arthritic fingers from seizing up entirely. I read recently that Tumeric and Black Pepper capsules taken daily help with brain function and memory loss (some University in California did a trial). I've always maintained a fit and healthy lifestyle then along came my auto immune condition which has tried it's best to bump me off but I'm still winning so far. I have never smoked and don't drink haven't since my 20's and have always eaten healthily. I can no longer exercise due to my disintegrating joints, I can barely move but on the upside I'm never ill. I don't get colds and flu nor any of the bugs going around, I'm teflon coated where such things are concerned so it's swings and roundabouts. grannysue05 After a good swig of my home-made turmeric, black pepper and vodka cold remedy your brain won't function and you will have no memory at all. I'm afraid, with very few exceptions, that OTC vitamins are useless and not recommended by any scientific study. You may feel better for taking them but it's really a placebo effect, all in your head. A proper diet gives all the vitamins and minerals you need, even vegetarians like me, and vegans. If you want to waste your money...OTC vitamins are the way to go. There are individual cases where illness causes a depletion or malabsorption of certain minerals but then, your GP would advise what, when and how much is needed. There was a very informative article in yesterday's paper. If I can find it I'll provide the source which makes interesting reading. I think a Vit D supplement is a good idea at this time of the year. I think it helps to some extent. However, my dear late husband did all the right things - exercise, diet: low fat, low sugar, didn't smoke, no excessive drinking, high fibre, 'brain work' - but he got motor neurone disease and died at 56 - so am I bitter? Yes. a bit. After that trauma I relied on more instant meals as I'd lost interest in food. Five years later I'd put on weight and was diagnosed with lymphoma. I told the consultant about DH and asked, "Would you blame me that if anyone lectured me about healthy eating I'd feel like telling them where to stick it?" His answer was, "No". I am in remission now and have returned to the healthy eating regime and take a few supplements (Vit D, magnesium and iron) and I may add something for my bones. I feel reasonable for my age (64) but I think more exercise would help. Sometimes it is just chance - those who take are of themselves can become ill and those who don't sail through without a care in the world. A positive attitude probably helps. You get enough Vitamin D3 in daylight...unless you live underground. I saw a you tube video by a cardiologist, who recommended that everyone take a magnesium supplement. He said the soil is now so depleted that no one gets enough, and it is this that contributes to all of us having all the auto- immune and inflammatory problems. I started to take it and it helps me, sleep, stop my twitchy legs and other things. It is used throughout the body for so many things. I am dredfully unfit and dread getting even older. Hey ho, que sera. I think looking after yourself is always a good idea. I never have and, at 62, I have had cancer and have a heart condition. These are both things I MAY have avoided if my lifestyle had been healthier. However - at 58, my husband has always been one of the strongest and healthiest people I know, despite also not living a healthy lifestyle. Around this time last year, he started suffering unexplained falls, his fingers started to curl inwards and his speech became very slurred. After resistance to visiting a doctor, the shocked reaction of a friend who had not seen him for a while led him to change his mind at the end of September and by the end of October he had been diagnosed with Motor Neurone Disease. As far as I can tell, this disease cannot be predicted, cannot be cured and has no effective treatment - and living a healthy lifestyle would have made no difference at all. I think what I am trying to say is live a healthy lifestyle because it makes you feel good and, hopefully, will impact positively as you age but also be aware that you never know what lies ahead. Just to add - I was writing my post before beigecardigans appeared and I have basically just repeated what she said. Not sure about that Gabriella. I tend to go out well covered at the moment. I will be starting my supplement today.